Vocalist, songwriter, improviser, a passionate visionary. Anna Maria Jopek’s style is a fusion of improvisation, Polish traditional sounds, and European classical music. Born into an artistic family – Anna Maria’s grandmother and father were accomplished singers, she was literally raised backstage – in concert venues and in the dressing rooms of legendary Polish folk group “Mazowsze”, where her parents performed. She was only three years old when she recorded a song for the Polish Radio. At the age of seven, she began her musical education in piano class, and at the age of twelve, she performed at the Warsaw Philharmonic. Graduate of Fryderyk Chopin University of Music in Warsaw and student of philosophy at the Warsaw University. For years, Jopek has been writing music and adopting classical and traditional themes to exceptional, multifaceted projects that bring together the world’s most outstanding musicians such as Pat Metheny, Branford Marsalis, Gonzalo Rubalcaba, Richard Bona, Oscar Castro-Neves, Makoto Ozone, Noa, Mino Cinelu and others. She also had the pleasure to sing with: Sting, Youssou N’Dour, Bobby McFerrin, Ivan Linz, Nigel Kennedy and Dianne Reeves. AMJ has performed at the world’s most renowned concert halls such as: Carnegie Hall, Hollywood Bowl, Royal Festival Hall, Tokyo Opera City Concert Hall, Blue Note Tokyo, The Israeli Opera in Tel Aviv or Hamer Hall in Melbourne. She recorded at Peter Gabriel’s Real World Studio, Abbey Road in London and Power Station in New York. She has won every prominent Polish music award possible. 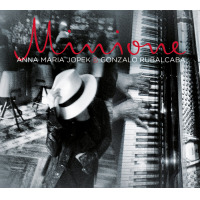 In 2017 Anna released the album “Minione” (Bygone) with Gonzalo Rubalcaba. The album presents pre-war Polish tangos and reached the 2017 top ten of Poland’s music bestsellers. In October 2018 she is releasing her new album „Ulotne” (Elusive) recorded with Branford Marsalis that escapes classification of music styles and broadly interprets Slavic motifs in scales, poetics and moods. “Ulotne” also features such stellar musicians as Krzysztof Herdzin, Mino Cinelu, Maria Pomianowska, Robert Kubiszyn, Pedro Nazaruk, Marcin Wasilewski, and Atom String Quartet. AMJ is convinced that art constitutes the spirituality of our times and that music is a universal language that connects people of all cultures, beliefs, and traditions. She believes in the beauty and gift of listening. Jopek lives between Warsaw and Lisbon, devoted to her children and cats. Running in marathons is her occasional hobby. All About Jazz musician pages are maintained by musicians, publicists and trusted members like you. Interested? Tell us why you would like to improve the Anna Maria Jopek musician page.